Staying physically active can help older adults relieve arthritis pain as well as other symptoms associated with this disease. Family caregivers should find the best low-impact exercises for their senior loved ones to do to prevent more joint pain and muscle tension. Here are some good exercises for seniors with arthritis to add to their weekly schedules. Although you want your loved one to do low-impact exercises, he or she can still take up some high-impact aerobic exercises that burn calories without negatively impacting the joints, such as Zumba. This dance exercise can help aging adults use all of the muscles in the body without overdoing it and causing more pain. Search for senior-friendly Zumba classes your loved one can take at the local gym. He or she can also sign up for other dance courses, including ballroom dancing and salsa. Although dancing is fun, it is a form of exercise that can relieve arthritis symptoms while boosting heart health. Older adults who need assistance performing physical activities can benefit from professional in-home care. Whether your elderly loved one needs part-time assistance with basic household chores or you need a break from your caregiving duties, the Rhode Island respite care experts at Home Care Assistance are here to help. All of our respite care services are backed with a 100% satisfaction guarantee, there are no hidden fees in our contracts, and we never ask our clients to sign long-term contracts. 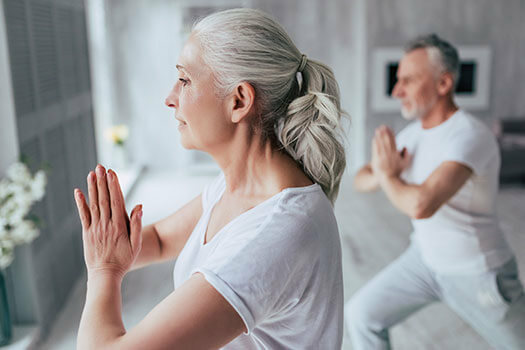 Yoga is a simple exercise for older adults with arthritis, but it provides many health benefits. Regardless if your loved one has tender or swollen joints, he or she can still participate in yoga. The deep relaxation routines done with this exercise can help seniors reduce joint inflammation and maintain a healthy immune system. Doing gentle stretches can enhance your loved one’s mobility. Adults with arthritis should avoid advanced stages of yoga, such as power yoga and hot yoga, as these exercises can put more pressure on the joints. Building leg strength is important for seniors with arthritis, which is why they should add chair stands to their regular exercise routines. When doing chair stands, your loved one will focus on controlling his or her motions. It is okay if your loved one needs to use his or her arms while doing the reps. When the exercise seems too easy, your loved one should find a lower-height chair to use. However, he or she shouldn’t overdo it. Doing chair stands strengthens the legs, making it easier to move around indoors and outdoors. Engaging in physical activities is one of the healthiest lifestyle choices for older adults. If your aging loved one needs help managing everyday tasks or encouragement to adopt healthier lifestyle choices, turn to Home Care Assistance, a leading provider of home care. Rhode Island Home Care Assistance provides professional in-home caregivers around the clock to help seniors live longer, happier, and healthier lives. Your loved one doesn’t have to get up and go to the gym to work his or her muscles out. Instead, he or she can do daily stretches at home that relieve pain and increase mobility. In addition to stretching the arms, legs, knees, and other body parts, your loved one can add workout accessories such as nylon straps. The purpose of doing stretches is to help seniors with arthritis ease joint pain and increase their flexibility. Stretching on a regular basis can lubricate your loved one’s joints and enhance his or her range of motion. If your aging loved one needs help maintaining a regular exercise routine, consider hiring a professional in-home caregiver. In Rhode Island, home care agencies can be a great boon to seniors. With the help of the caregivers at Home Care Assistance, your aging loved one can lead a happier and healthier life. We offer a revolutionary program called the Balanced Care Method, which encourages seniors to eat nutritious foods, exercise and socialize regularly, and focus on other lifestyle factors that increase life expectancy. Learn more by calling (401) 284-0979 today to talk to one of our friendly care managers.